I give illustrated talks on Ancient Egypt to other societies and regularly taking part in an annual event of free educational talks at libraries in my local area. 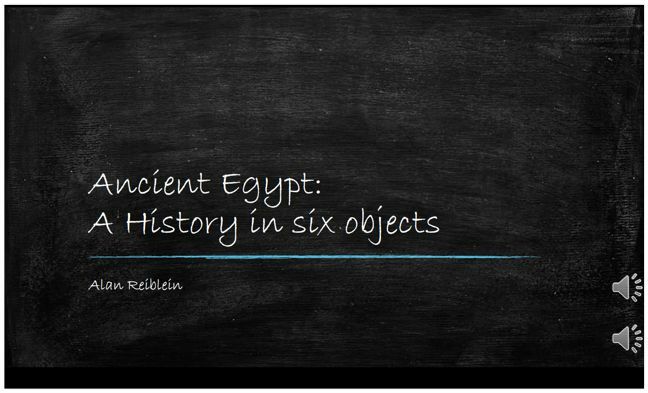 Here is a short voice annotated talk on The History of Ancient Egypt in Six Objects. Click on the blackboard or the link here. A walk through the colour science available to the ancient egyptians which continued being in use until the production of synthetic colours in the 1900's . Examines the nature, structure execution and symbolism of Egyptian wall paintings with reference to the relationship in time with other neighbouring cultures. This talk is a guide through the various texts from Ancient Egypt which make up their belief and concepts of the Afterlife. A view of Belzoni taken in the context of his own time. A talk on the classic radio broadcast from Cairo Museum in 1939 when the trumpets of Tutankamun were sounded. Be amazed at the depth of knowledge and technology available to the Ancient Egyptians. I have also written articles on Ancient Egypt.